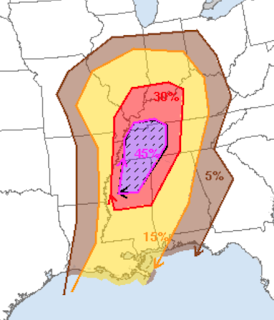 While we have a significant tornado risk later today (see below), we have another serious risk tomorrow. On this particular map 15% (yellow) is the significant threat threshold. The forecast probabilities are considerably higher than that. 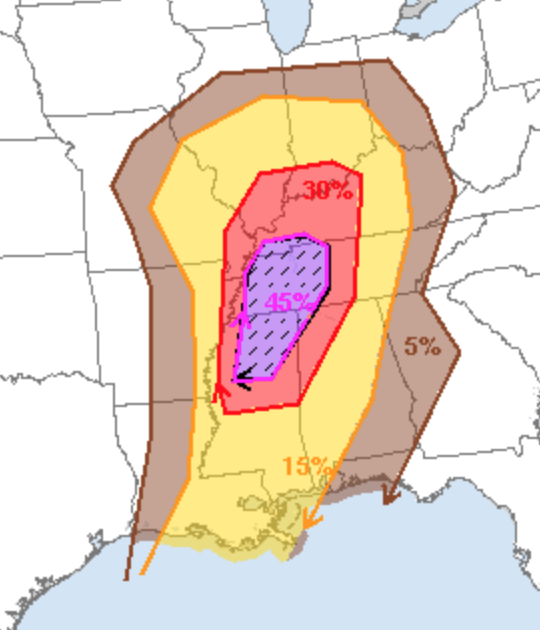 The hatched area is where violent tornadoes are expected which includes both Nashville and Memphis. So, what should you do at this point? Make sure you have at least two, independent, sources for tornado warnings. I recommend the AccuWeather smartphone app and WeatherCall. They will give you the warnings for your home (or other selected location) with a few false alarms as possible. Reminder: I provide real-time storm information -- based on good science and without hype -- on Twitter @usweatherexpert . Of course, I will update this blog on today's tornado threat later today and on tomorrow's threat tomorrow morning.